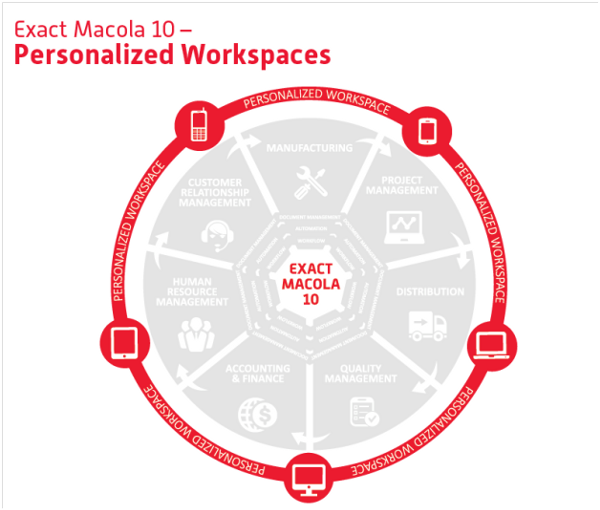 Personalized Workspaces are fully configurable collections of Exact Macola 10 functionality which are role-specific. They allow SMB manufacturers and distributors to move beyond data entry to better business management. Upgraded functionality now provides critical business intelligence with intuitive role and department-specific Workspaces to help companies clearly understand what’s going on in real-time, and why. A dashboard is an easy to read, one screen visual summary of the analysis of information. Essentially, it’s an overview of your business — or a specific part of it — at-a-glance. Information at a glance is great, but when you need actionable information to make business decisions, a dashboard alone can sometimes lead to a scavenger hunt for more information. Workspaces aren’t your typical executive dashboards — they’re more. Workspaces help you make sense of data by taking it into actionable information. Workspaces 2.0 combines the functionality and convenience of having role, function or departmental specific information presented at-a-glance with powerful database intelligence. Together the functionality allows you to see what makes up the data. You can go beyond the dashboard to drill into information and values. You can also perform analysis, uncover answers to specific questions to understand what’s happening in the operation, and complete actions like process approvals all without pulling up a myriad of portals and screens. PwC’s Annual Global CEO Survey revealed that 81% of manufacturing CEOs see mobile technologies as being strategically important for their enterprises. Workspaces 2.0 further addresses the critical nature of mobile access and how to compete in a marketplace without boundaries. With Workspaces, you can work anywhere, anytime, 24 x 7. All you need is an internet connection to work client-server, in a browser-based environment (e.g. access from home or public PC), on your tablet, and with your smartphone. New functionality in Workspaces 2.0 provides more freedom and control in day-to-day business operations. • Add Workspace widgets to your homepage to create your own Workspace and customize your web parts utilizing the same SSRS technology used in the standard Workspaces. • Open configurable menu links right in a modal window (light box), so that you don’t have to navigate away from your Workspace. • Configure actions in the new transaction and maintenance screens. This super cool feature allows you to configure actions while doing data entry for quick access to pertinent data or for initiating related processes. • Add aggregate data across multiple divisions for specific Workspaces. For example, you can select multiple divisions and see all of your receivables across all divisions. Learn more about new features and functionality in Workspaces 2.0 . Watch the demo. Workspaces were designed to improve productivity, save time, and allow you to have a more natural ERP experience. New visual design upgrades mean you don’t have to be a data scientist to interpret multiple points of information quickly. Facts, figures and statistics are presented in a graphical format on a single screen, so you can access the most valuable and useful set of information in an intuitive manner. Reason # 5 — You’ll get all the information you want and nothing you don’t. In the past, you would have to a lot of time reviewing and analyzing different reports to end in a final conclusion. Workspaces allow you to see an overall situation report of your business — giving you the information and confidence to make solid business decisions. Need to gain control over margin leakage? Need to review the data on receivables, payables, or complete financial statements and consolidate financials among business units? No problem. Designed to give you the right information at the right time, Workspaces use smart, contextual menus and enables you to dive deeper or take action — directly from the Workspace. This allows each person to see the level of detail they need in order to get their job done and meet their goals. Workspaces in Macola10 have more than 42 pre-built Workspaces to get started. They can be geared toward a specific job like shop floor manager or a specific group like accounting. When you need a different configuration, you can build more complex Workspaces from the ground up, or modify them from an existing template. Leveraging big data was once a very expensive proposition reserved only for elite manufacturing juggernauts. With Workspaces 2.0 in Exact Macola10, SMB manufacturers and distributors have a right sized solution to gain a better understanding of their business’ past, present and future. Now, detailed insights into performance can be obtained from the field and shop floor to the customer site and executive suite to help firms hit goals faster and more efficiently.